Supply chain capabilities are guided by the decisions you make regarding the five supply chain drivers. Each of these drivers can be developed and managed to emphasize responsiveness or efficiency depending on changing business requirements. As you investigate how a supply chain works, you learn about the demands it faces and the capabilities it needs to be successful. Adjust the supply chain drivers as needed to get those capabilities. 1. PRODUCTION – This driver can be made very responsive by building factories that have a lot of excess capacity and use flexible manufacturing techniques to produce a wide range of items. To be even more responsive, a company could do their production in many smaller plants that are close to major groups of customers so delivery times would be shorter. If efficiency is desirable, then a company can build factories with very little excess capacity and have those factories optimized for producing a limited range of items. Further efficiency can also be gained by centralizing production in large central plants to get better economies of scale, even though delivery times might be longer. 2. INVENTORY – Responsiveness can be had by stocking high levels of inventory for a wide range of products. Additional responsiveness can be gained by stocking products at many locations so as to have the inventory close to customers and available to them immediately. Efficiency in inventory management would call for reducing inventory levels of all items and especially of items that do not sell as frequently. Also, economies of scale and cost savings can be gotten by stocking inventory in only a few central locations such as regional distribution centers (DCs). 3. LOCATION – A location decision that emphasizes responsiveness would be one where a company establishes many locations that are close to its customer base. For example, fast-food chains use location to be very responsive to their customers by opening up lots of stores in high volume markets. Efficiency can be achieved by operating from only a few locations and centralizing activities in common locations. An example of this is the way e-commerce retailers serve large geographical markets from only a few central locations that perform a wide range of activities. 4. TRANSPORTATION – Responsiveness can be achieved by a transportation mode that is fast and flexible such as trucks and airplanes. Many companies that sell products through catalogs or on the Internet are able to provide high levels of responsiveness by using transportation to deliver their products often within 48 hours or less. FedEx and UPS are two companies that can provide very responsive transportation services. And now Amazon is expanding and operating its own transportation services in high volume markets to be more responsive to customer desires. Efficiency can be emphasized by transporting products in larger batches and doing it less often. The use of transportation modes such as ship, railroad, and pipelines can be very efficient. Transportation can also be made more efficient if it is originated out of a central hub facility or distribution center (DC) instead of from many separate branch locations. 5. INFORMATION – The power of this driver grows stronger every year as the technology for collecting and sharing information becomes more wide spread, easier to use, and less expensive. 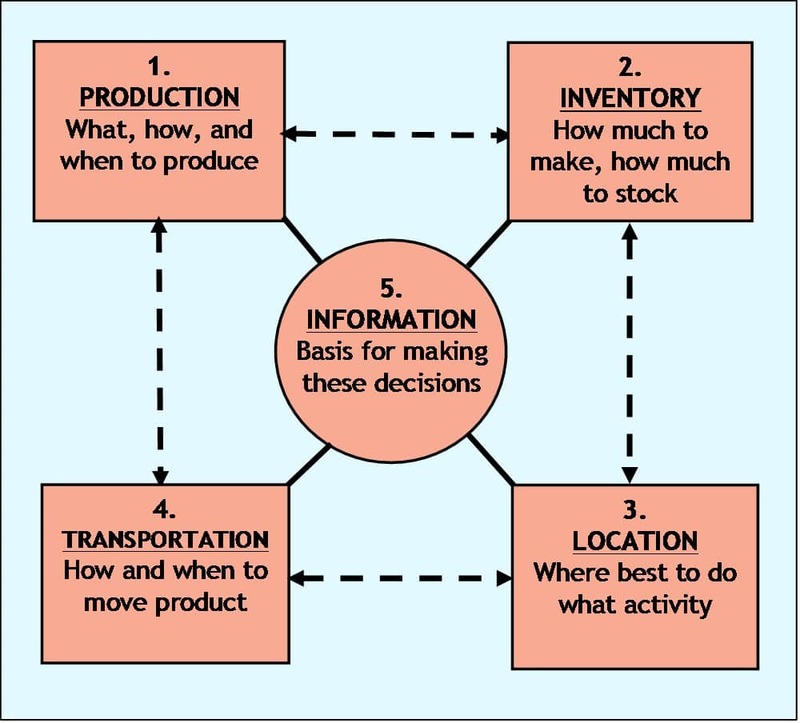 Information, much like money, is a very useful commodity because it can be applied directly to enhance the performance of the other four supply chain drivers. High levels of responsiveness can be achieved when companies collect and share accurate and timely data generated by the operations of the other four drivers. An example of this is the supply chains that serve the electronics market; they are some of the most responsive in the world. Companies in these supply chains, the manufacturers, distributors, and the big retailers all collect and share data about customer demand, production schedules, and inventory levels. This enables companies in these supply chains to respond quickly to situations and new market demands in the high-change and unpredictable world of electronic devices (smartphones, sensors, home entertainment and video game equipment, etc.). Over the long run, the cost of one driver — Information — continues to drop while the cost of the other four drivers continues to rise. Companies that make effective use of information to increase coordination internally and externally with their supply chain partners will gain the most customers and be the most profitable. The table below summarizes what can be done to guide the five supply chain drivers toward responsiveness or efficiency. Companies and supply chains continually adjust their mix of responsiveness and efficiency as situations change. Efficiency is good — Efficiency drove the economy of the 20th century. The push for efficiency increased productivity and lowered the prices of products from automobiles to home appliances thus making them available to a wide segment of the population. Yet efficiency requires two things that are becoming much harder to find. The first thing is predictability. To efficiently plan and manage production and distribution of products you need to know what the demand will be for those products, and you need to know what the cost of raw materials will be and what the selling prices will be for the products. Then you can optimize your operations to produce the right amounts at the right prices and maximize profits. Efficiency requires one more thing — stability. You need to know that demand and prices will remain relatively stable for some number of years (5 or 10 years or more). Because then you can build factories and stores and transportation infrastructure to enable your efficient operating model. Efficiency is best when producing relatively simple commodity products and services that sell in more predictable and stable markets. Responsiveness is better — In the 21st century, responsiveness is what drives the economy. Responsiveness is what drives continuous innovation in products and technology and continuous change in the ways we organize businesses and serve customers. The big companies of the 20th century were efficient manufacturing companies (Ford, GM, US Steel, Kodak, Whirlpool etc. ), but the big companies of the 21st century are responsive service and technology companies (Alibaba, Amazon, Apple, Facebook, Google, Starbucks, Tencent, etc.). All these 21st century companies certainly need to be efficient, but their success is based mostly on their ability to sense and respond quickly to changing markets and evolving customer desires. Lowest price is not always the deciding factor in purchasing decisions; people want what they want. They want products and services that respond quickly and meet their needs and desires. Apple and Starbucks do not sell the lowest priced laptops or cups of coffee, nor does Porsche make the lowest priced cars, but as long as people value the quality and innovation offered by those companies and others like them they will pay more for their products. Home delivery of everything from clothes to groceries costs a bit more, but people value and pay for the responsiveness and convenience of those services. Responsiveness is best when producing more complex and unique products and services that sell in continuously changing markets shaped by evolving technology and new customer needs and desires. Even within supply chains that emphasize overall responsiveness there are still segments of those supply chains that should focus on efficiency. For example, segments of supply chains that connect factories with warehouses and distribution centers should be as efficient as possible. In most cases they should use the most efficient transportation modes and delivery schedules. And segments of supply chains that connect warehouses to end use consumers should usually focus on responsiveness and use transportation modes and delivery schedules that emphasize responsiveness because customers have come to expect fast delivery of products. In every supply chain some operations will need to focus on efficiency and others on responsiveness. That mix continues to shift over time as customer preferences and market conditions change. New technologies such as robots, drones, artificial intelligence and 3D printing are making big impacts on how supply chains operate. And yet after all is said and done, these new technologies can be employed to do one of two things: increase efficiency or increase responsiveness (or some blend of the two). See our blog article “Five New Supply Chain Technologies and How to Use Them” for ideas about how new technologies can be used to improve efficiency and responsiveness of the supply chain drivers, and create supply chains that become competitive advantages. One company making good use of information and technology to manage their supply chain drivers is Zara Clothing Company. Zara’s supply chain is a big competitive advantage (screenshot below shows design of Zara’s supply chain in Spain). It sells unique clothing products in a constantly changing market shaped by popular fashion and new customer desires. See our case study about how Zara’s supply chain makes it’s unique business model such a success – “Zara Clothing Company Supply Chain“.